One of the things I love about being a business owner and helping others in their businesses is that you get to make decisions about the clients you take on and the work you do. And, even better, you get to decide how much money you make. But you’re not going to be able to make what you want by continually bringing on small potatoes clients. You need to up-level and bring on top-tier clients who need deeper, higher-paying work from you. You can’t attract these types of clients overnight and you probably will struggle to bring them on board when you’re brand new in your VA or OBM business. But the more you work at it, the more these drool-worthy clients will start flocking to you. The key here is work at it. There’s a lot you can do to find these primo clients. I recommend starting with a few tricks and then growing from there. You are a product of the people you surround yourself with. When you’re the highest-paid admin in the room, you’re not going to attract the right clients to you. But when you put yourself in front of people who are a step (or two or three) ahead of you in business, not only do you learn from them, they can learn from you too. And that’s going to get you noticed. Join groups (both paid and unpaid) where your ideal client is hanging out. To find out what these groups are, follow people online that you want to work with and pay attention. Ask them. And do some group stalking to see if you can find out the caliber of people in a variety of groups. 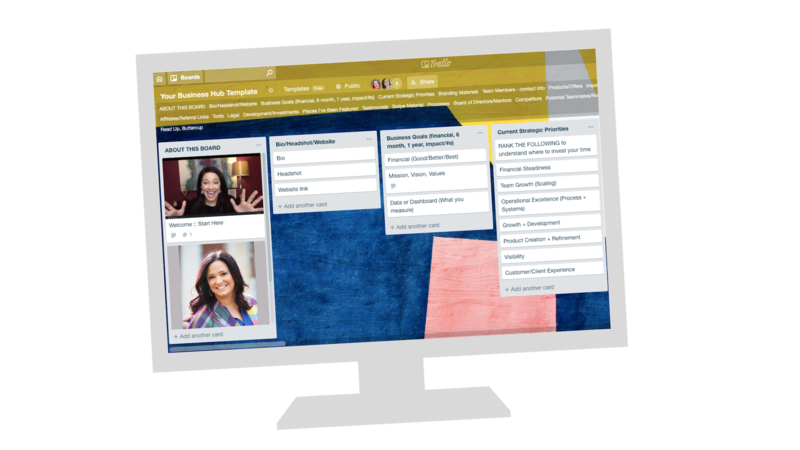 Have virtual coffee dates with people who hang out with your ideal client and get to know others in your industry who are further along in business than you. You’ll be surprised how many people will jump at the chance for a little virtual networking. Do you know what pain point you’re solving for your clients? Every service you offer needs to deliver a solution. Take something off their plate, give them a sigh of relief, finish something they need. It needs to be the right solution at the right time. Make sure your offer makes sense for who you’re talking to. Top-tier clients are looking for all-in-one solutions, rather than piece-mealed project done by multiple people. The more you can simplify their business life, the better. Don’t price your offers based on what you think someone will pay; price offers based on what you need to take home. Then make sure you include the value needed for that price point. The tools you have in your business are one of your biggest assets. I’m not talking about your scheduler or your project management system; I’m talking about the tools in your noggin. No one else has the same skillset, the same processes, or the same personality as you. Use all of these to your advantage! And a quick note about this: You aren’t less-than. You are uniquely you, and that’s what makes you so awesome. Do your best to let go of the mindset that you’re not ready or good enough for this. Sister, you are! Managing projects and balancing spinning plates is in your blood, you have special skills that CEOs don’t have. That positions you to help them take care of the back-end of their business like no one else. Make sure that everyone knows this–in your story, your marketing, your website and in conversations. If you have a process you take clients through or a system that you’ve developed to ensure your clients’ success, give it a name and start talking about it. This is a tool that no one else has and it makes you more marketable to those high-tier clients. What else can you do to attract the highest-tier clients possible and grow your business? I’m so glad you asked. 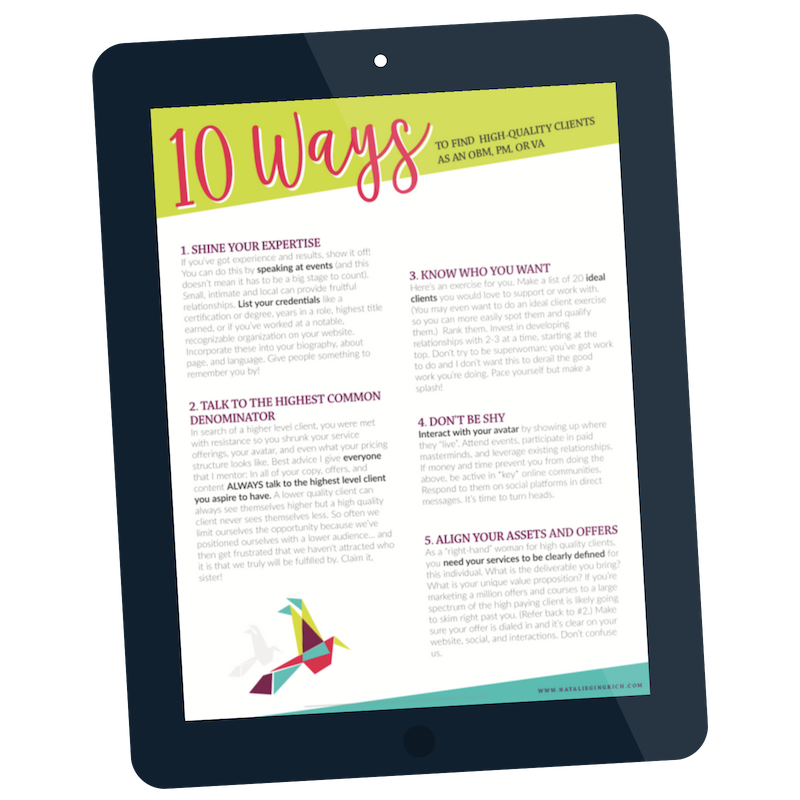 Grab my downloadable guide for 10 key things you can do!